The replacement to Huawei’s successful P20 and P20 Pro will likely come during the first few months of 2018, and rumors about the device’s new features are starting to leak. The P20 Pro was a trendsetter when it launched in March 2018, introducing the world to a high-performance triple-lens camera system with a night mode, plus the now more widespread gradient color scheme. What will the sequel bring? Here’s what we know so far. The standout feature on the P-Series has always been the camera, and the P20 Pro set the bar for others to beat in 2018. The P30 is highly likely to add another camera lens to the setup, taking it from three to four, according to Huawei Europe boss Walter Ji, who said in an interview, “Next year we will definitely see more innovation in the camera. Now we have three, imagine four next year.” He also commented on a greater zoom capability, potentially up to 10x. However, that fourth lens may not be used for photography. Instead, the fourth sensor may be a Time-of-Flight sensor (ToF) usually used for AR/VR mapping. Take this with a pinch of salt at the moment though, and wait to see what the other serial leakers find out in the coming months. Huawei has been linked to Sony for the P30, and according to this rumor may use the forthcoming IMX607 sensor, which may add a 38-megapixel sensor to the phone. Huawei’s own Nova 4 and Honor’s View 20 both have 48-megapixel sensors. What will the P30 or P30 Pro look like? A series of cases for the P30 Pro model have been spotted for sale through online retailer MobileFun which may give us a hint. The rear of the phone may once again have a series of camera lenses running down the left side, but this time there may be four rather than three. Olixar Huawei P30 Pro case on the left, and P30 case on the right. There is no sign of a fingerprint sensor on the front or back of the phone, indicating the in-screen fingerprint sensor from the Mate 20 Pro will come to the P30 Pro. The screen has a teardrop-style notch at the top, much like the Mate 20. This is surprising, as the Pro versions of Huawei phones often have more complex face recognition systems requiring a larger notch. It’s possible this is speculation on the part of case maker Olixar, which may only have dimensions for the phone’s body rather than final renders of the full design. Olixar’s case is not the only one that has been spotted. 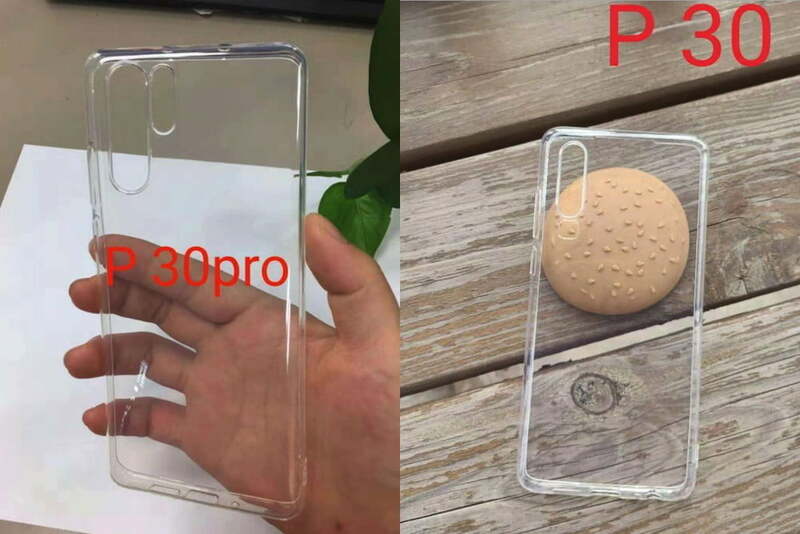 A case for the non-Pro P30 was leaked with a slightly different design, showing an elongated camera cutout on the left, and a further section underneath. It’s not clear why this is separate. The Olixar P30 case seems to combine the second cutout into one single larger cutout. 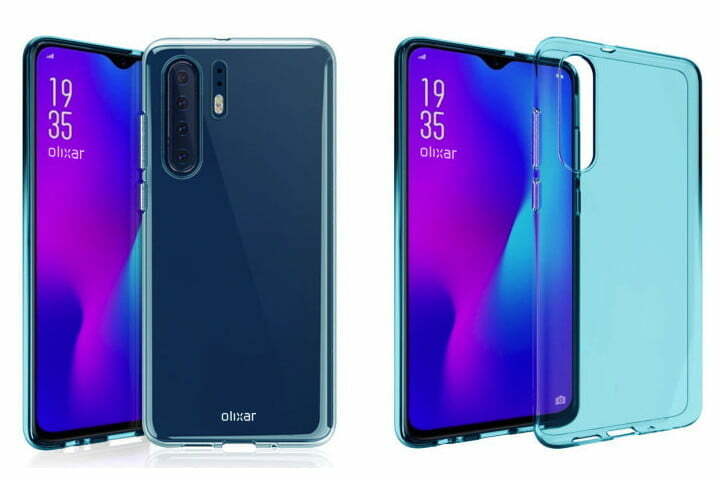 The P30 Pro case in the Twitter leak from Ice Universe closely matches the Olixar case’s look. No specific details have leaked about the Huawei P30 or P30 Pro’s other features. However, it’s almost certain the phone will use the Kirin 980 processor, as Huawei is unlikely to replace it until later in 2019. It’s possible the phone will have 5G capabilities, according to some rumors; but this may arrive on a modified version of the phone at a later date, with 4G LTE models being released first. The Huawei P20 Pro was announced in March 2018 at an event in Paris. Huawei may choose to launch the P30 at Mobile World Congress at the end of February 2019, or again decide to hold a separate event shortly afterward. We will update here with more Huawei P30 and P30 Pro rumors as they come in. Updated on December 27, 2018: We’ve added the latest rumors that the fourth sensor on the P30 may be a Time-of-Flight sensor.